I am happy to announce that I have survived two-thirds of my Whole 30 challenge. 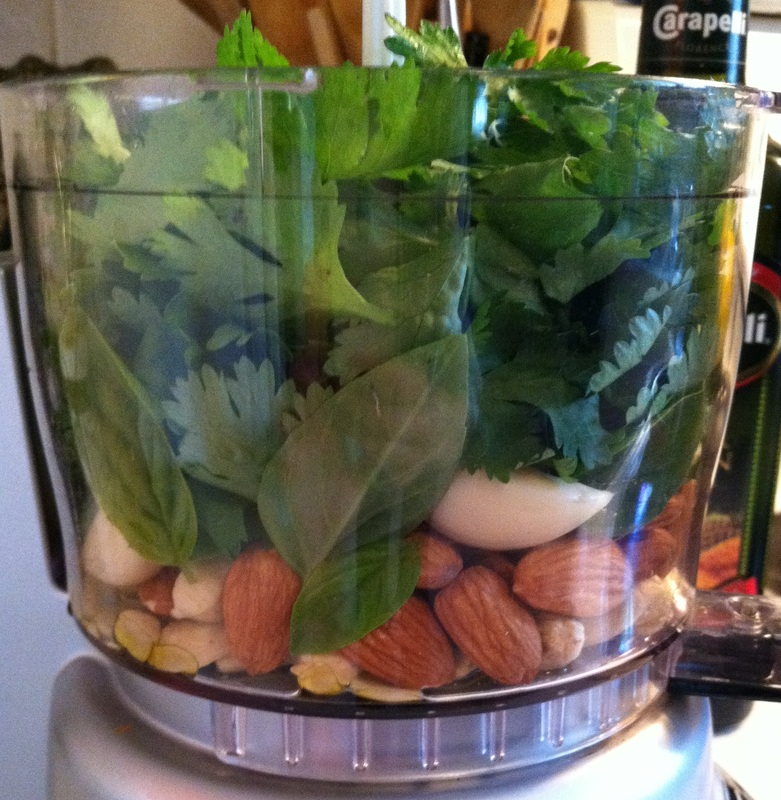 That’s a total of 20 days without grains or dairy. No rice or beans. No sugar. No alcohol. No corn. Nothing packaged, processed, or refined. It’s been quite the journey. Some days have been really tough. Other days, I barely notice. Long days at work can be a particular challenge. Every day, I pack my cooler full of plenty of healthy snacks and fresh fruit to get me through the day and past the never-ending temptations of coffee shop donuts and vending machine snacks. When I get together with friends, I find that if I can cook for them, they are so pleased with the meal, that they don’t even take notice to the many common ingredients that are missing. On Sunday, the Buffalo Bills took us on a roller coaster ride of emotions. At one point, there was a strong glimmer of hope that we would defeat Tom Brady and the Patriots. Sadly, we still found a way to crash and burn, so to make up for the loss, I had to come up with something very tasty to eat. 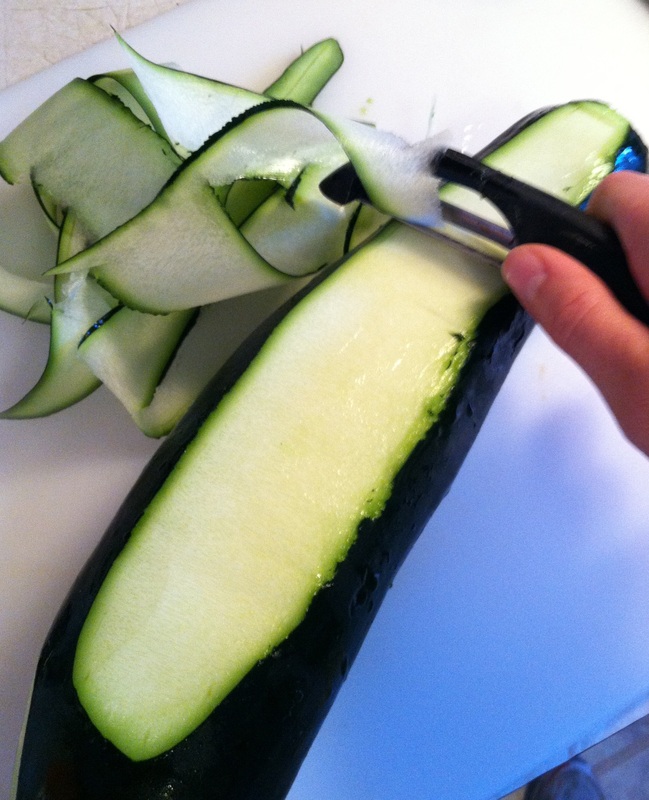 Steam the zucchini ribbons in a steamer basket for 5-10 minutes. If you don’t have a steamer basket or a vegetable steamer, blanch the noodles in boiling water or sauté them in coconut oil until they lose some of their firmness, but still remain slightly crisp. While these are cooking, boil the shrimp until they turn pink. 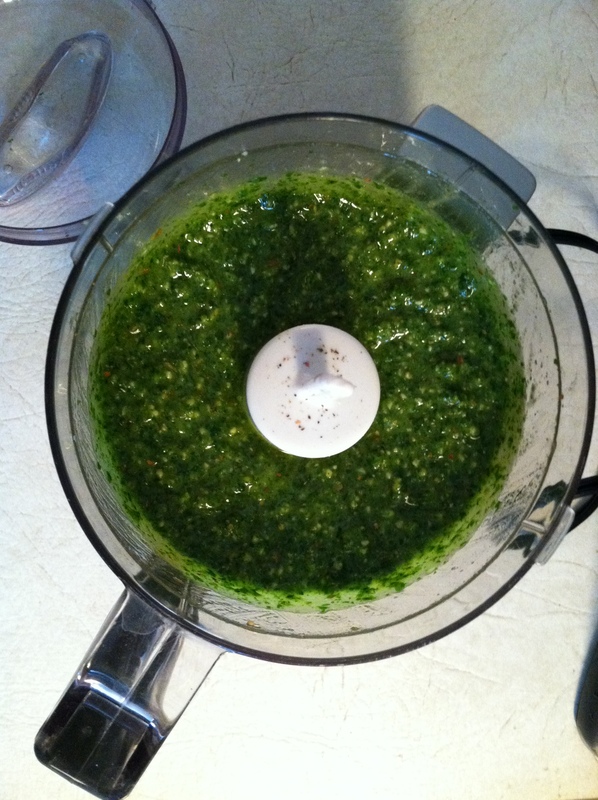 The pesto will add so much flavor that there is no need to cook the shrimp in oil or add any seasoning. Slice the cherry tomatoes in half. 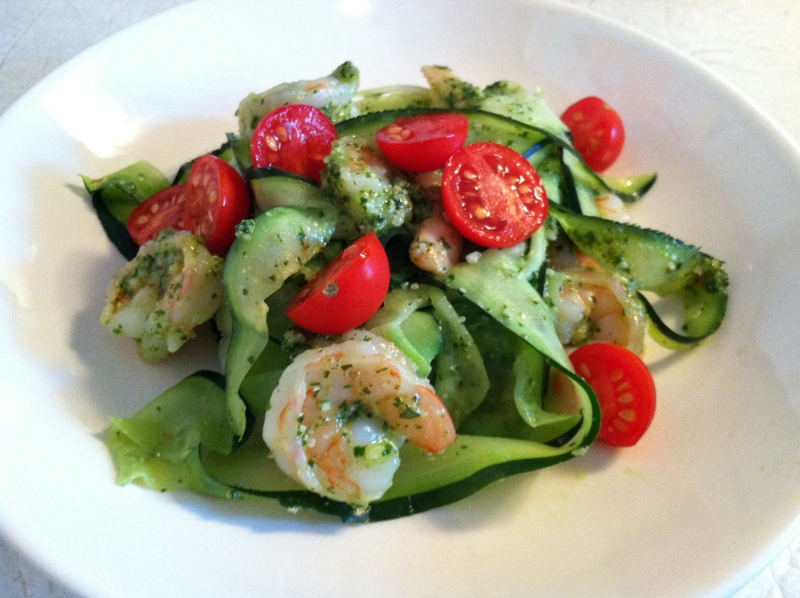 When the zucchini noodles are done cooking, drain them in a colander to remove any extra moisture. 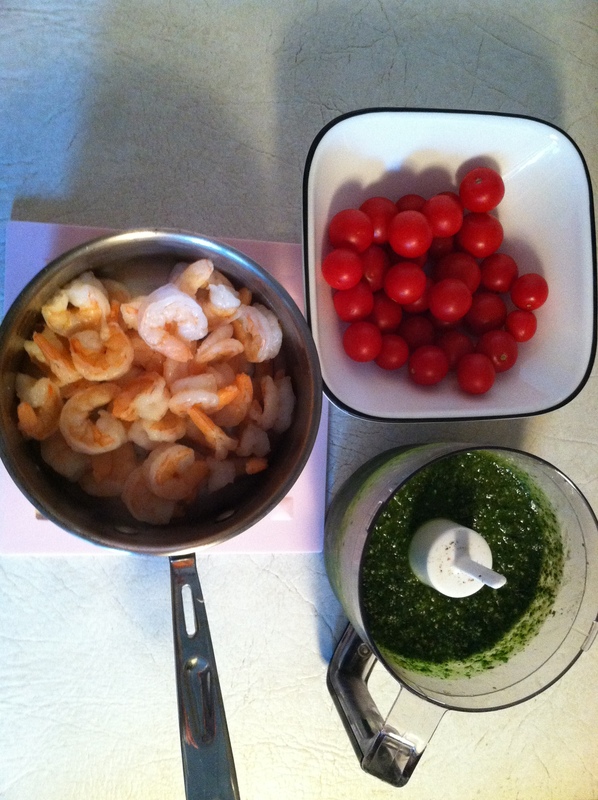 Then, toss them with the pesto, shrimp, and tomatoes. 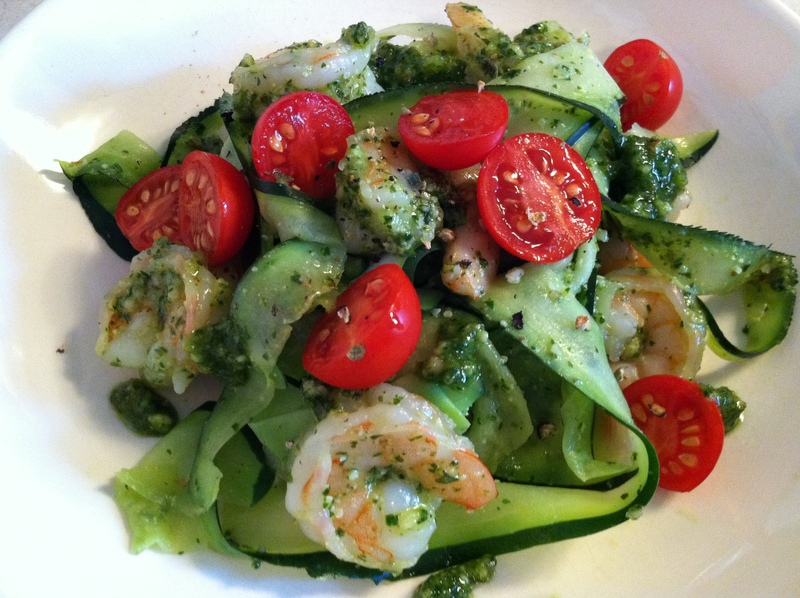 Plate the noodles, add salt and pepper to taste, and enjoy! Thanks CrossFit Caveman. I hope you love it…let me know how it turns out for you! « In need of a massage…for my kale!